The northern slopes, or "the backside" of the Catalina Mountains near Tucson have a mining history that goes way back. On this trip, I hoped to explore an area south of the town of Oracle. My plan was to drive out several miles on a 4wd road, park the truck and then walk a loop of about five miles that involved crossing La Canada Del Oro, one of the area's major drainages. If I was able to follow my planned route correctly, I would pass several old mine tunnels, shafts and open cuts. I had no idea what to expect at those sites, but I was hoping to see more than just the mine openings themselves. From what I had been able to learn, the area had been active from the 1930's to the 1960's It appears that the miners were chasing the ores of several metals--gold, silver, copper, manganese, zinc, molybdenum and tungsten. I was fortunate that on the day in April that I was able to make the trip that a cooling trend had been forecast. I got an early start and was surprised to find that the 4wd road I needed had been recently re-worked and the roughest sections had been smoothed out. So I was able to drive pretty quickly to the spot that I had picked out on the map as the starting point for the hike. If I had not not been able to reach that point, the hike would have been much longer and much more strenuous! As it was the 5 miles that I did walk was still a pretty good hump. The Sycamore and Cottonwood trees had leafed out and because of the wet winter, water was flowing in even the smaller canyons. The stream in Canada Del Oro was running strong. The hike out of Canyon Del Oro was steep and took some effort, but the views were great. By that point, I had passed several buildings, a couple that were pretty new, but all had been abandoned. The immediate areas around the old shafts and tunnels were empty of any mining relics. At the time, I did not realize that I had walked very close by an old rock arrastra. I would spot it as I closed the loop later in the day. The scenery and the potential "benefits" of physical exercise had been my only real rewards so far.Then as I turned into the portion of the loop that would take me back to the truck I stumbled onto the best old engine that I have ever seen out in the hills--it was an old two cylinder Fairbanks Morse diesel! I am not certain why it was set up where it was. It was not at any of the old mined areas. Perhaps it had been moved into position for some future use. There were no water tanks, fuel tanks or air tanks that would probably have been needed for the engine's operation. As the photos show, it in itself is very complete. 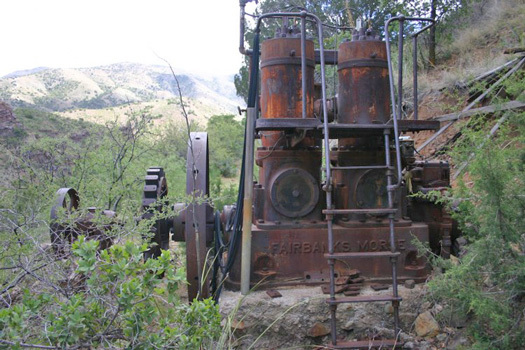 After leaving the engine, I came across the second great "find" of the trip--the old rock crushing arrastra. Needless to say after all of that, I was really amped up and the rest of the walk back to the truck was a piece of cake! It had been a day that had started and would end with some 4 wheeling, and in the middle there had been some strenuous walking that took me past some very interesting old relics. What a life!